Defeats Pokémon in 2 turns. Only works if the Rattata is on of the top percentage Rattatas and if it is holding a focus stash, but it is a top percentage Rattata so it has one anyways. 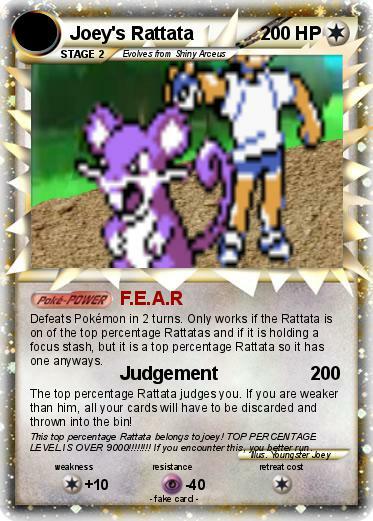 The top percentage Rattata judges you. If you are weaker than him, all your cards will have to be discarded and thrown into the bin! Comments : This top percentage Rattata belongs to joey! TOP PERCENTAGE LEVEL IS OVER 9000!!!!!!!! If you encounter this, you better run.